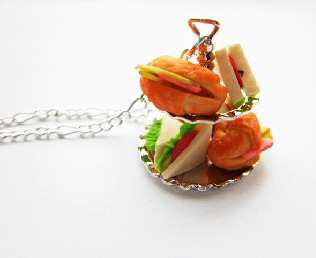 Filled with handmade miniature polymer clay snacks including, ham sandwiches and ham and cheese filled crossiants. Attached to a silver plated 2 tier tray. Chain is approx: 18in long. Due to the handmade nature of these products, styles and sizes may vary.